Loads over stairs? No problem! 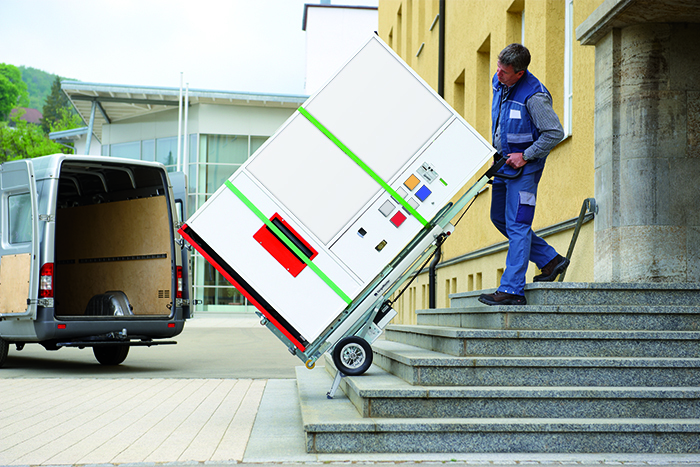 AAT Alber Antriebstechnik GmbH is the manufacturer of mobile, flexible and practical stair climbing systems and additional drives for the transport and rehab technology sectors. With the slogan “Ideas move you”, AAT is making a confident promise to the public and demanding the highest standards of itself. Extremely motivated employees make an essential, far-reaching contribution to the quality of our products with their commitment and creativity. Its site in Germany is an essential part of AAT’s company philosophy. The central theme of helping people is always a core focus when we develop new products. Trust the original with over 35 years experience! we have put together a selection of common cargo to help you select the right CargoMaster for your needs. Of course, you can also transport other goods with our CargoMasters. Transporting heavy goods is one of the most demanding jobs in logistics. It often requires two people and they can take a very long time to transport heavy goods from A to B. Not to mention the huge amount of physical stress that more often than not leads to permanent health issues. “CargoMaster” stair climbers can take the strain! 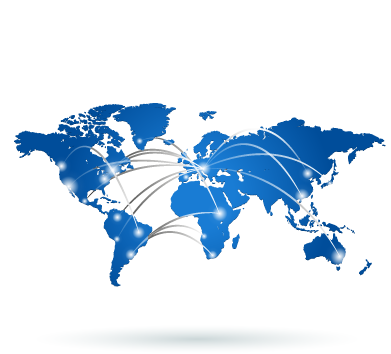 They allow employees to work far more efficiently and the purchase price will pay for itself in a short space of time. They also protect backs and joints, which reduces the number of employees who need to take time off work. The CargoMaster can be used on virtually any subfloor, and can even deal with spiral staircases. Safety brakes automatically stop at the stair edge. CC series load stair climbers are AAT’s newest development. The CC series is setting new standards in ease of operation and handling due to its various technical innovations such as ComfortStep and the multi-level batteries display. Lifting capacity up to 200 kg. are particularly suitable for situations in logistics, where it's not just safe transport that matters, but where climbing speed and flexibility are also crucial. 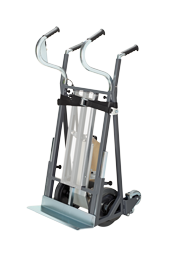 The CargoMaster can transport up to 400 kg up stairs in a straightforward, reliable fashion. are specially designed to transport wide, high and extremely heavy goods. It transports up to 350 kg, so it's ideal for boilers and ovens etc. With our professional service concept AAT once again proves its superior quality standards and offers its clients an all-inclusive package. Application videos and videos on the climbing process. Are you still dragging heavy loads up stairs? Or are you already a CargoMaster user? 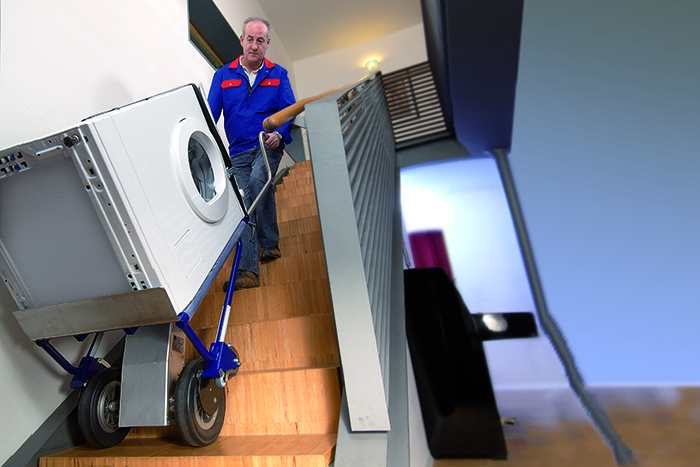 Transporting heavy loads up stairs is one of the most difficult transport situations. Often, it requires two or three people to get properly stuck in. You can also benefit from our more than 30 years of expertise in stair climbing. 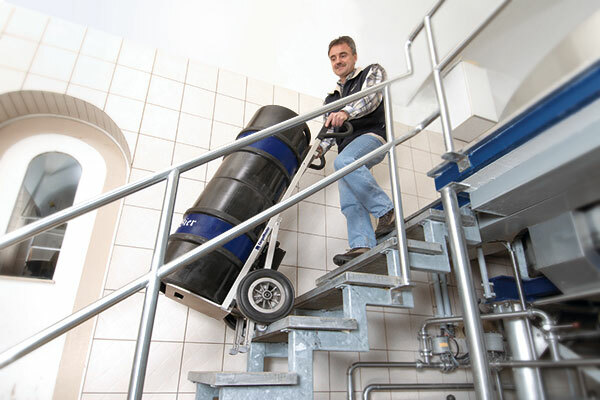 The CargoMaster stair climbing unit protects your back and minimises the risk of accidents. 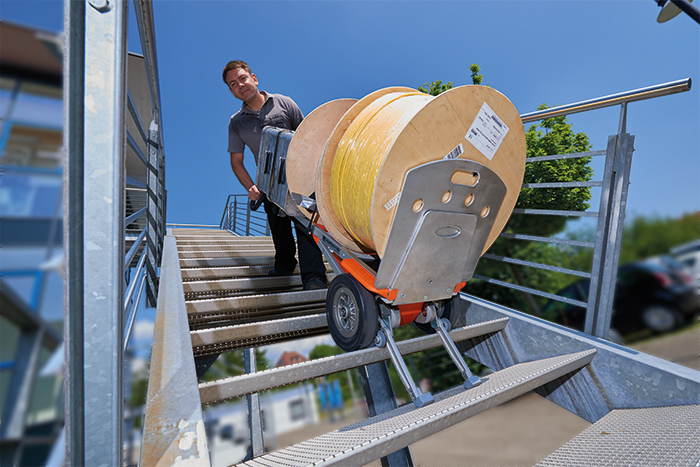 The CargoMaster doesn't get back pain and will become your most reliable partner for stair transport jobs that you simply cannot do without. 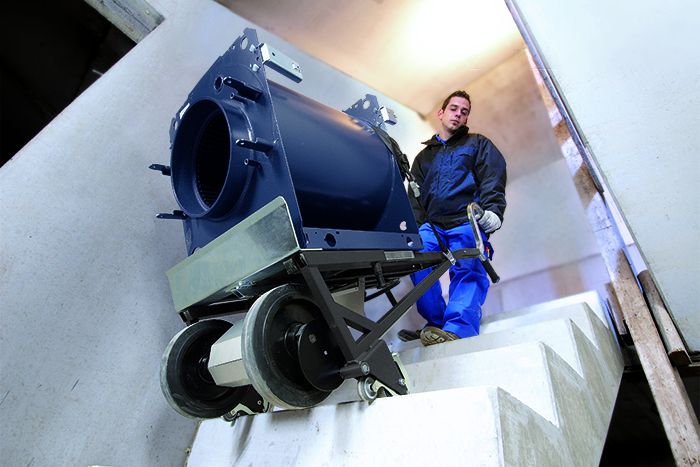 You can even negotiate spiral staircases or loads up to 400 kg effortlessly. Stair climbing barrows from AAT – A safe investment for your health and your wallet. 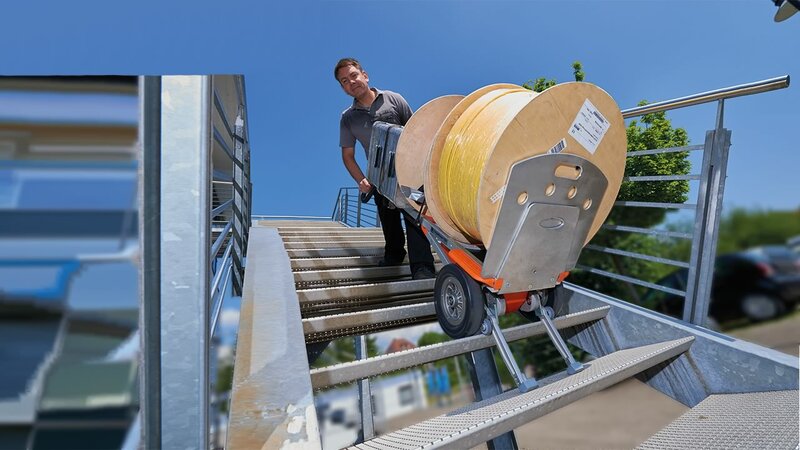 When you use our CargoMaster electric stair climbing barrows, often only one person is needed to transport even very heavy loads quickly and safely up stairs. 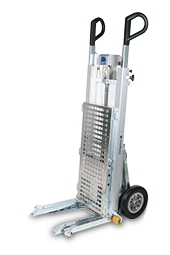 Our stair climbing units can also deal with your transport issues. Work efficiently and professionally with our stair climbers. AAT is the only manufacturer that offers “max. safety” as standard! All models are fitted with our patented step braking system. But there's a small crucial difference – trust the original “Made in Germany”. Our electric stair climbing barrows can be quickly and easily retrofitted, often without any tools, due to our extensive range of accessories. 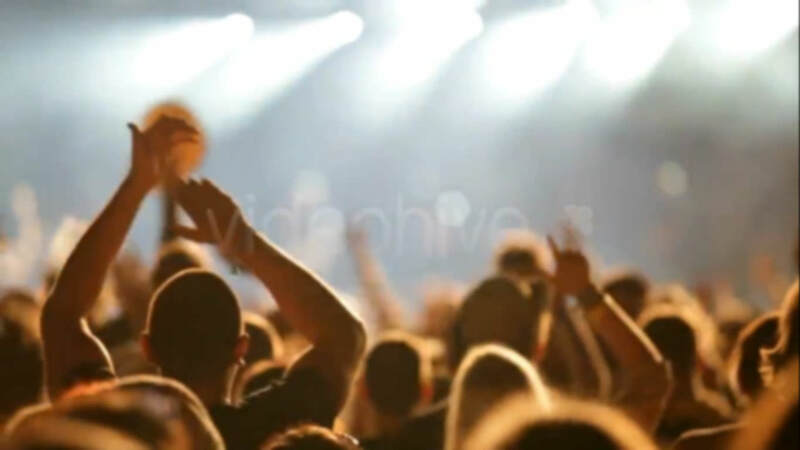 You can handle very special requirements on a day-to-day basis! 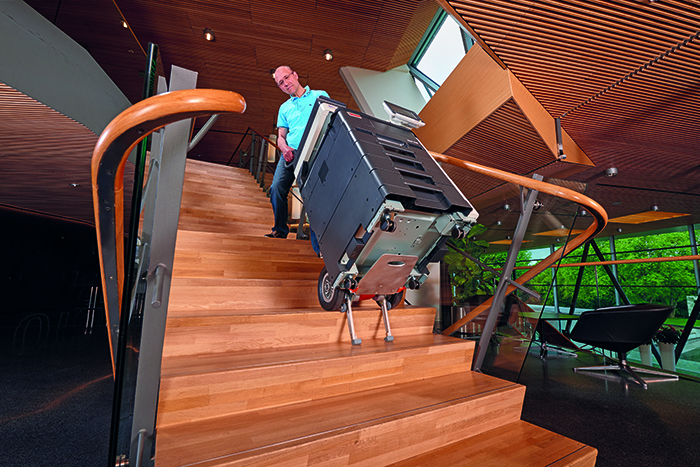 CargoMaster – The stair climbers by professionals, for professionals. We offer the most appropriate stair climber for a wide-range of sectors – whether it's for trade, industry or wholesale. Get in touch and find out how you can use the expertise of the no. 1 for “transporting loads up stairs”. Can the CargoMaster also be used to climb spiral staircases? Yes, even narrow spiral staircases can be negotiated without any great effort. Do CargoMasters damage the stairs/flooring? No, stair edges and high-quality stair coverings are not damaged by our stair climbers. How safe is the CargoMaster to use? 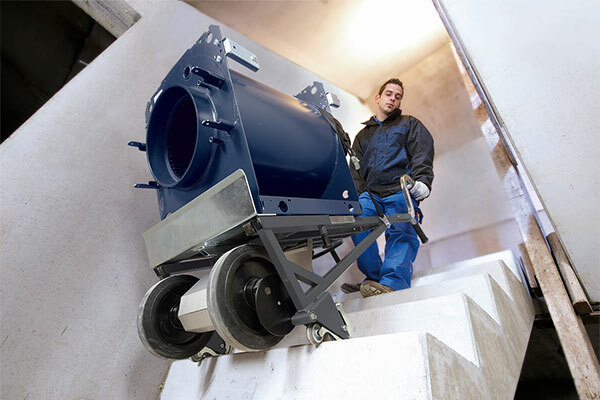 The CargoMaster will become your reliable and safe partner for any transport issue up stairs due to the patented AAT brake that automatically stops at the stair edge. What loads can I transport? 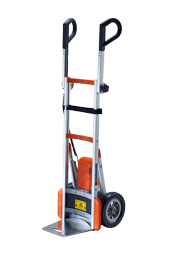 The CargoMaster can be adapted to a wide range of cargo using our extensive range of accessories and shovels. What is the difference between a stair crawler and your electric stair climbers? Our electrical stair climbers make climbing even narrow spiral staircases a piece of cake. However, crawlers can only be used to climb straight staircases. Where are your stair climbing units manufactured? All of our stair climbing lift trucks are manufactured in Germany. “Made in Germany” quality for over 35 years. Can fragile loads also be transported? Very fragile can also be conveniently transported with little vibration due to the smooth touchdown in ComfortStep mode. How many people are needed to operate it? Our electric stair climbers are designed in such a way that they can be operated by just one person. How much weight can I transport up stairs with a CargoMaster? 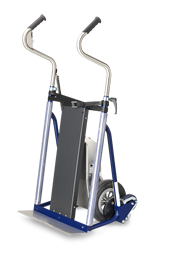 Loads up to 400 kg can be transported with our C400 electric stair climbing hand truck. 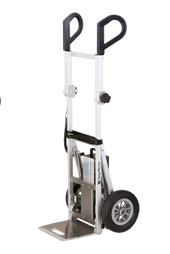 What is the difference between an electric stair climber and an electric stair climbing hand truck? There’s no difference. Our electric stair climbing systems just have different descriptions. We will be happy to answer any other questions you may have.